Details Truly a room with a view! 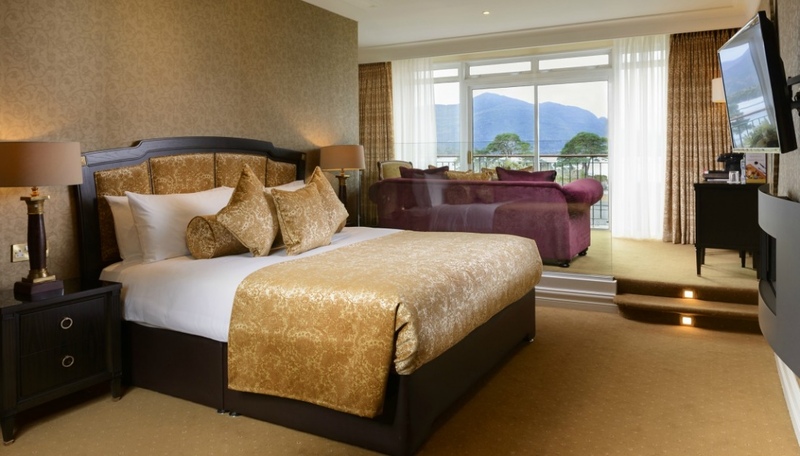 The Deluxe Lake View Junior Suite is the best room in the house – fully renovated and refurbished in spring 2017, this luxurious room has a breath-taking view over the ancient ruins of the 17th century McCarthy Mor Castle (floodlit at night) and the world famous Lakes of Killarney. As you enter the room, the soft, golden tones of the fabrics and furnishings surrounding you create a sense of warmth and relaxation. Sink into plush carpets as you wander past the marbled bathroom, the custom designed Italian furniture and super king sized bed as you are naturally drawn to the full size glass doors which take up one full wall and allow you to appreciate the natural beauty laid out in front of you. 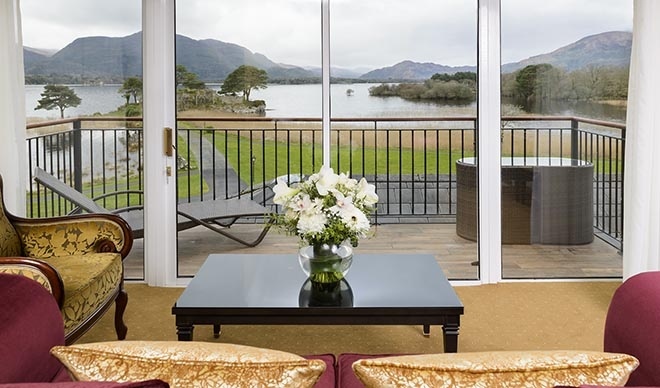 The deluxe seating area facing the glass doors is ideally placed to invite you to sit, unwind and absorb the magnificence of the mountains, rivers, lake and sometimes a curious deer or stag as they wander past on their way through Killarney National Park. With an outlook such as this, there should be little need for a television, however just in case there are now three in the room, including one in the bathroom so whilst enjoying a soak in the slipper bath, one can keep up with the rest of the world. As there are full tea and coffee facilities in the room, air-conditioning, complimentary wifi and a large balcony beyond the glass doors, the Deluxe Lake View Junior Suite at The Lake Hotel, has it all for that special treat or occasion.